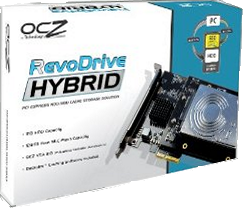 A hybrid disk drive has two levels of cache, a traditional chunk of RAM (Random Access Memory) and a small amount of flash memory, what amounts to a small SSD (Solid State Disk). The caching is handled by the disk firmware without any involvement from the OS (Operating System). The advantage is even if the OS crashes, the cache is not corrupted. 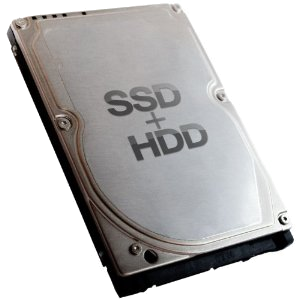 For the same amount of money you can get a much larger separate SSD and use caching software. Sata 3. 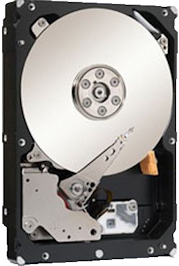 1TB, You could think of this as an ordinary 5400 RPM disc with a huge cache. Still, 64MB is not very big compared with a separate SSD drive. Replaces model ST750LX003. There are many variants in features and price. Seagate Momentus XT ST750LX003, 8 GB Flash cache and 32 MB RAM cache, 2.5 Inch, 64 MB Cache, 7200 RPM, SATA-3 6 Gb/s. 750 GB. Separate SSD drives are typically at least ten times this size. Also comes in a much cheaper SATA-2 3 Gb/s version. Replaced by model ST1000LM014. RVDHY-FH-1T. Not a SATA drive. It plugs directly into a PCI slot. 100 GB Flash cache. No RAM cache. Only 5400 RPM. Max Read: 910 MB/s, Max Write: 810 MB/s.